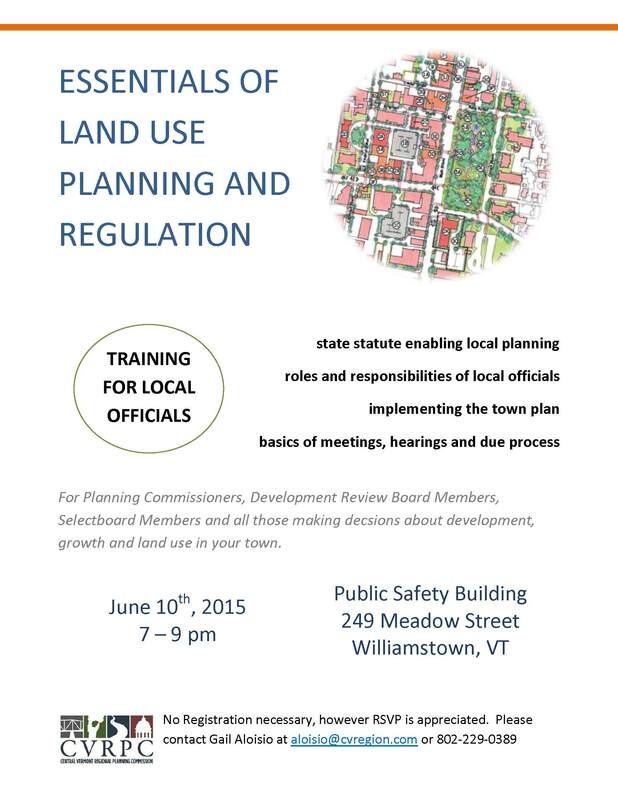 CVRPC invites local officials, especially those who are newly appointed, to receive training on the Essentials of Land Use Planning on June 10th in Williamstown. The training is intended for all officials or community stakeholders who make decisions about growth and development in your town. Selectboard Members, the Development Review Board, Zoning Administrators and any others thinking about land use are encouraged to attend along with the PC. 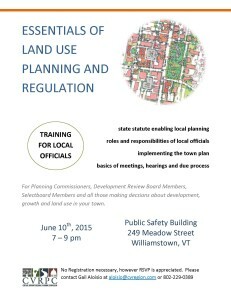 During this 2 hour training, we will cover the state statute that enables local planning, roles and responsibilities of local officials, implementing the town plan and the basics of meetings, hearings and due process. Officials will have the opportunity to discuss particular concerns for their town with CVRPC staff and other local officials. The training is free and will be held from 7-9 pm on June 10th at the Williamstown Public Safety Building. Registration is not necessary, however an RSVP is appreciated. Please contact Gail Aloisio at aloisio@cvregion.com or 802-229-0389 to RSVP or with any questions. CVRPC Staff will be hosting a training of a new web tool called the VT Forest Stewardship Atlas. Click here to view the invite. The purpose of the Forest Stewardship Atlas is to provide access to geographic data related to forests. This site allows you to view, identify and query the datasets; print and export maps; and output summary reports. Web accessible forest stewardship data will help landowners, towns and forest managers to inventory and assess forest resources in order to more effectively manage these resources.